I love muffins, and I love fruit desserts, so it was inevitable that I’d adore these tri-berry muffins. The original recipe calls for fresh fruit, but I tried them with frozen and the result was great. Yes, I baked these myself, but one was served to me this morning as part of breakfast in bed! Happy Mother’s Day to everyone who is a mother, or has a mother. Sift the all-purpose flour, whole wheat flour, 2/3 cup sugar, baking powder, baking soda, salt and cinnamon together in a large bowl and stir. In another bowl, combine the milk, egg and melted butter. Make a well in the middle of the dry mixture, pour the wet mixture into the well, and stir until just combined. Stir in the mixed berries. Stir gently, just to combine. Spoon the batter into the muffin cups and sprinkle tops with 1 Tbsp sugar. Bake for 20 to 25 minutes, until a cake tester comes out clean and the tops are nicely browned. Makes 10 – 12 small muffins, or 8 – 9 large. Beth these muffins look amazing I love beries too! Great looking muffins! And I'm glad you scored breakfast in bed. Happy Mother's Day! Happy Mother's Day, Beth! We too adore muffins, esp. when they are made with fruits.Yum! These muffins look scrumptious! Fresh, or frozen, a berry is a berry. Lovely muffins. I made some too yesterday, but they were from a mix. Happy Mother's Day! Ooh, these muffins look wonderful! I could go for one right now. Happy Mother's Day, Beth! Happy Mother's Day, Beth. Love that poem…I guess you can read it many different ways, but maybe we always hope for our children to be a little bit better than we are?…or we teach them to do right even when we aren't always right ourselves. Love that. I also love these muffins – yum! Can't go wrong with Barefoot Contessa and I love that you used the frozen berries with great success. Happy Mother's Day! Thank goodness for sweet muffins! Those muffins look just "the berries!" And what is not to like about three berries in one recipe? 🙂 Have a great week! Ohhhh, I still have just a few frozen berries left from last year. This would be perfect! I love that poem. The muffins looks really good! I love berry muffins. Happy Mother's Day to you! Hope you had a wonderful Mother's Day! These look delicious. Happy Mother's Day! What a beautiful poem you shared with us. It was a pleasure to read…and these muffins? They were a pleasure to look at! I think berry muffins are a must during the spring and summer. Thank you for sharing them Beth! Lovely muffins, Beth. Sounds like you had a wonderful Mother's Day! Happy Mother's Day Beth! Those muffins are excellent! I hope you had a marvelous Mother's Day, Beth!!! Your tri-berry muffins look terrific!!! i can't believe regular milk made such moist muffins! i was expecting yogurt or sour cream or bananas. magnificent! Nice muffins Beth…and yes, I like the idea of adding all kind of berries in this muffins. 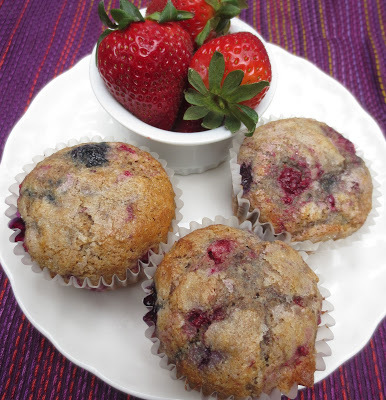 Beth, I always wanted to try out a recipe for a multiple berry muffin – I think that I just found the recipe that I was looking for – these muffins look fabulous, I also love the fact that you used some whole-wheat flour in your recipe! 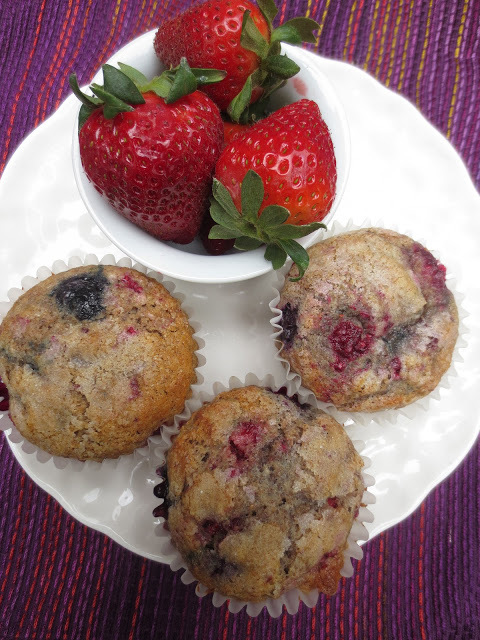 Oh…these berry muffins look awesome and delicious. 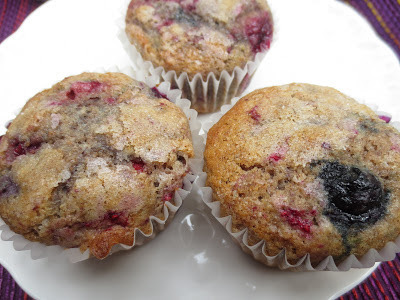 I love that you can see the vibrant colors of the berries throughout the muffins. Happy belated mother's day!! The.Boy has started hinting that he would like me to make him muffins for breakfast so I'm going to have to try these! Love how berry-full they are! berry-loaded muffins are the best! Beth, These look scrumptious!! A lovely breakfast treat! Hope you had a wonderful Mothers Day! I think I am dreaming about these muffins! Very sweet post Beth! I love Anne Lamott 😉 Anything baked with berries, especially muffins…I'm crazy about! Yummy! These muffins look delightful! Berry muffins are my favorite! Beautiful berry muffins! The poem and then the quote took my breath away. Different breathless moments.